The highest level of qualification is derived from the Census question asking people to indicate all types of qualifications held. People were also asked if they held foreign qualifications and to indicate the closest equivalent. There were 12 response options (plus ‘no qualifications’) covering professional and vocational qualifications, and a range of academic qualifications. Foreign Qualifications (Not stated/ level unknown). More than one in three (36.2%) Surrey residents aged 16+ has a level 4 qualification while around 1 in 6 (15.9%) have no academic or professional qualifications. 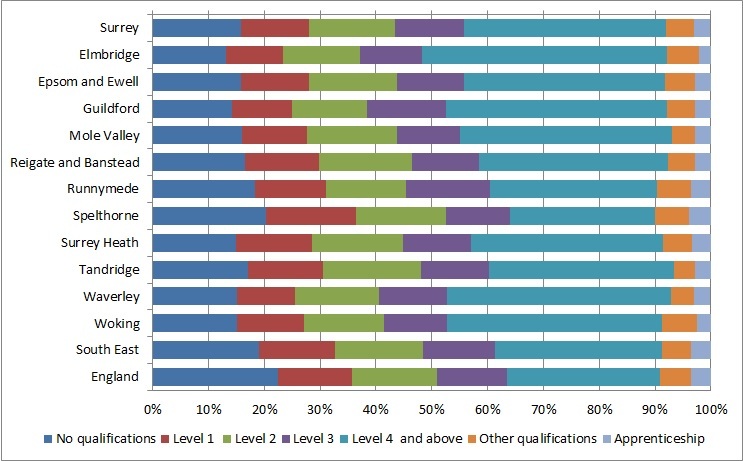 12.2% have qualifications no higher than level 1, 15.3% have reached level 2 and 12.3% level 3. 2.9% have completed an apprenticeship and 5.1% have vocational or work related qualifications or qualifications gained abroad where the level is not known. 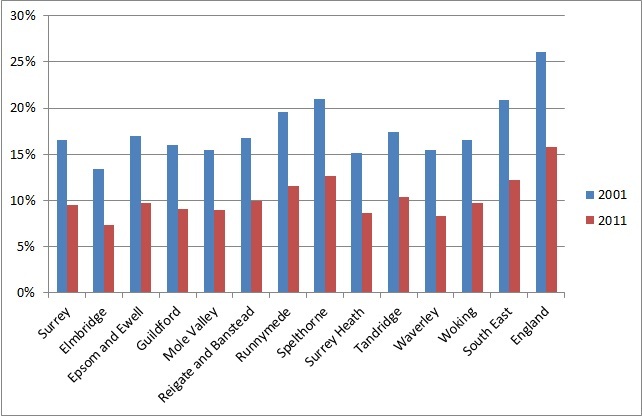 The borough with the most highly qualified population is Elmbridge where 43.9% have a level 4 qualification and 13.2% have no qualifications, and the least qualified is Spelthorne where 20.4% have no qualifications and 25.9% reached level 4. Surrey residents are more highly qualified than England as a whole where 22.5% have no qualifications and 27.4% have reached level 4. This data cannot be compared with the 2001 Census as those figures were only available for the population aged 16-74. When people under 25, who may not have competed their education, and people over retirement age are excluded from the figures, 43.5% of the main working age population are qualified to level 4, and less than one in ten (9.5%) have no qualifications. 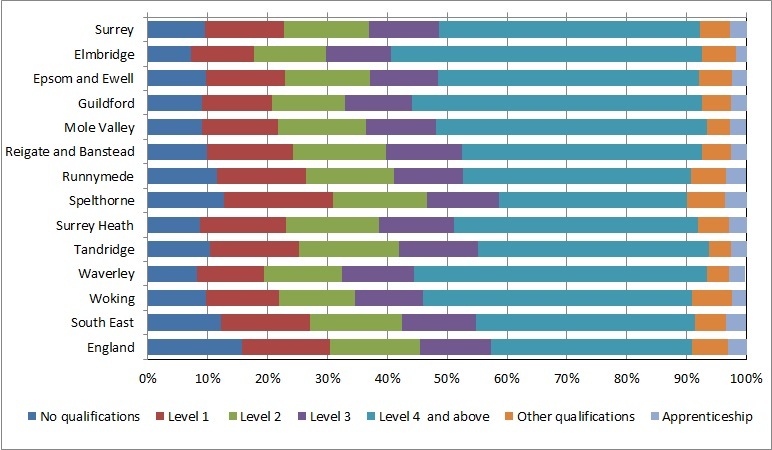 13.3% have qualifications no higher than level 1, 14.1% have reached level 2 and 11.8% level 3. 2.7% have completed an apprenticeship and 5.1% have vocational or work related qualifications or qualifications gained abroad where the level is not known. 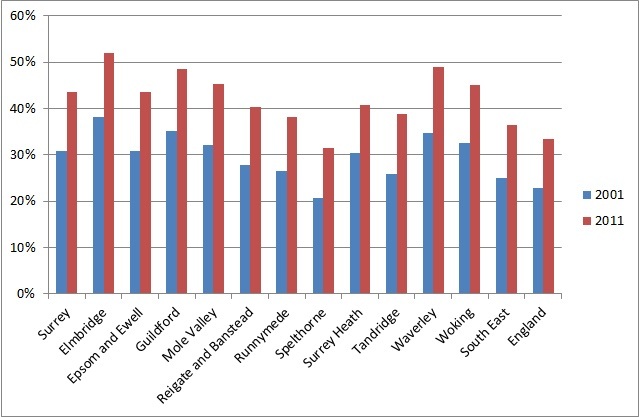 The borough with the most highly qualified working age population is Elmbridge where 51.9% have a level 4 qualification and 7.3% have no qualifications, and the least qualified is Spelthorne where 12.7% have no qualifications and 31.5% reached level 4. Surrey’s workforce is more highly qualified than England as a whole where 15.8% have no qualifications and 33.5% have reached level 4. 2001 Census figures for this age group are available and show that the workforce is becoming better qualified. Since 2001 the proportion of the population aged 25-64 with no qualifications has fallen by 7 percentage points from 16.5%, and the proportion with a level 4 qualification has risen by more than 12 percentage points from 30.9%.